The sofa in the living room is not necessarily the best environment for compiling your business To-Do list. It might be better to get into the right mind-set! Your office offers many advantages, including having all the information required to hand: diary, meeting notes, email exchanges, contact details, etc. In this way, you can be sure that you have not overlooked anything. As for the specific time – the day and hour are not important. A To-Do list should be aligned with your activities, not the calendar! However, you should ideally choose times when you are guaranteed not to be interrupted. It is a scientific fact: a pencil and notebook are more conducive to organised thinking than a computer keyboard. First and foremost, this method enhances the brain’s information retention capability. Once you have written down your To-Do list, a large proportion of it will already be clear in your mind, which will help you to achieve everything on it. You should also take advantage of specialist aids, such as the OXFORD Task Manager, a small and very handy To-Do list management notebook. The set of symbols, header box to group your tasks thematically and right-hand margin to add a date or name, mean you will always be able to check on the progress of your projects. An extra plus point is its compatibility with the SCRIBZEE® app! Ever-expanding To-Do lists are disheartening rather than motivational. Depending on your role, why not organise them thematically (“Project X”, “18 December event”, etc.) instead of by week or date? Then they become like tool boxes which you can access when you need to address a particular topic, and see at a glance what you still have to do and the deadline. To be a genuine productivity aid, your To-Do list should be easy to access and linked to the relevant topic. Once you have drafted it in your OXFORD notebook, you can scan it with SCRIBZEE®. Use the app to create a folder called “Project X”, for example, in which you can archive it with your minutes from meetings, key contact list, etc. This means it will always be to hand in your smartphone, and you will also have access to all the relevant information. Do you have a role which involves collaborating on projects with your teams or clients? Your To-Do list can be a very useful tool for everyone working alongside you. 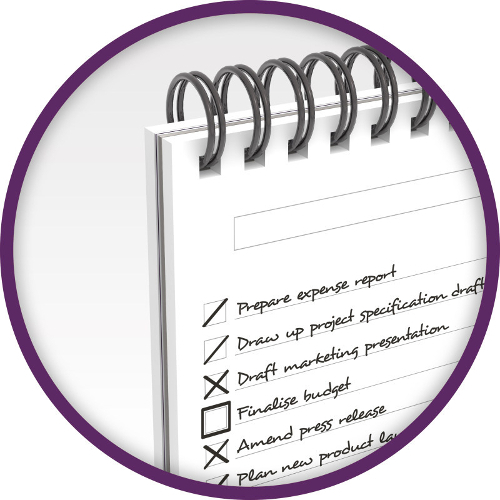 After a meeting, be proactive and draw up a To-Do list organised by stage and by participant. Record it in SCRIBZEE® and circulate it to your co-workers by email. In this way, all participants will have the same level of information and will be able to implement these actions to achieve their objectives. Not all tasks to be completed carry an identical risk factor or have the same degree of urgency. In order to identify priority actions quickly, you can adopt colour coding (by project, by deadline, etc.) or create a table (“Urgent”, “To do by 15 December”, “Schedule an appointment”, etc.). In order to be even more effective, you can enter the contact details (email address and telephone number) of the people you need to get in touch with on your To-Do list. This means you will not cancel the call or forget to make it because you do not have the details to hand at the appropriate time. If you follow this advice, your To-Do list will become the key to greater effectiveness all day long! Previous Post:Stay in touch with your teams even at a distance with SCRIBZEE! Next Post:Managers: learn to delegate!